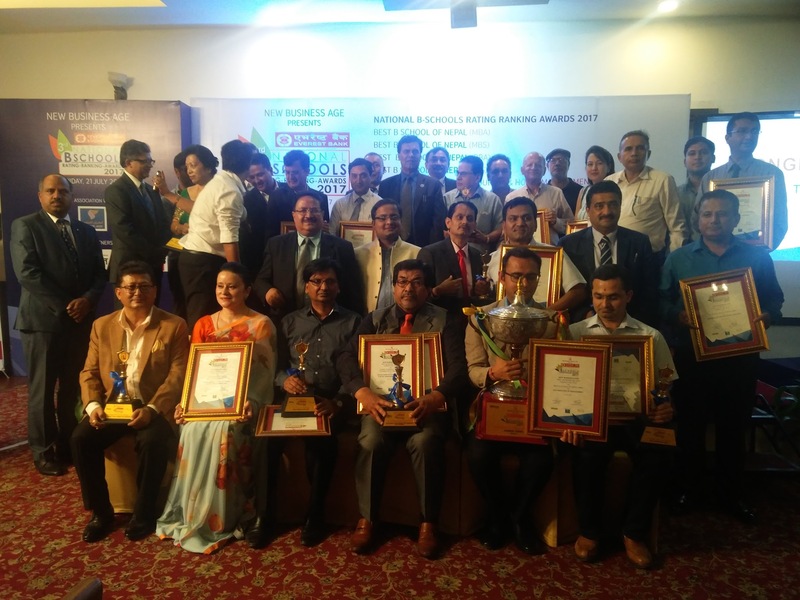 Out of 39 colleges offering MBA in Nepal, three Business Schools have been awarded as Best Business School-MBA in 3rd National BSchools Rating-Ranking Awards 2017 held in Hotel Annapurna, Durbarmarg, Kathmandu ON 21 July, 2017. Ace Institute of Management has been awarded as the best MBA College, where are Kathmandu University School of Management became the first runner up. KUSOM was awarded as the best B-School in the 2nd Business School Rating and Ranking Award. South Asian Institute of Management (SAIM) stood 2nd runner up in this ranking. CEO of New Business Age Pvt Ltd Mr. Madan Lamsal, CEO of Everest Bank Ltd, Mr. Someshwar Seth, Country Manager of Oman Air Mr. John Rodrigues and Chief Guest, Prof. Dr. Tritha Khaniya VC of Tribhuvan University collectively provided Medal and award certificate to the winner.